Today, we're going to look at class cards for Mage. Now that I've got a big bulk of cards behind me, I won't be reviewing quite so many cards each post. Blizzard has unveiled a sizable chunk of mage class cards for Knights, including the class legendary minion and the mage death knight. if it's cold. Or maybe a parka. I'm starting to detect a theme. book you just... let alone. 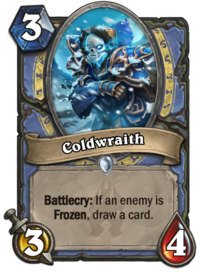 The Coldwraith is a solid body for the Mana cost, being able to survive trades with the majority of 1- and 2-Mana minions. It also has a nice rider effect. 3 Mana usually draws 2 cards, so drawing 1 card and getting a 3/4 body is good value. The problem is that the rider is conditional on an enemy being Frozen, meaning you either need to have a minion that can already Freeze enemies on the board and doing its thing the turn you play this, or you have to use a spell to Freeze an enemy. That makes this a card you will have difficulty playing on curve, which is always a flaw in a minion with a decent body for its stats. I don't think it's superb, but it's probably worth a Fair rating. 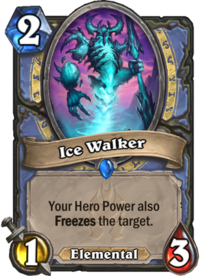 The Ice Walker is an interesting minion, modifying your Hero Power in a very salutary fashion. However, it's a very fragile body for its Mana cost. 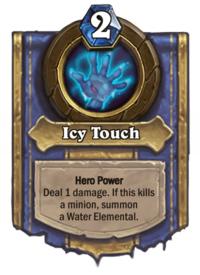 You can't play it on curve, although you probably don't want to, so as to get at least 1 turn of Freeze effect by using your Hero Power. It's also an effect that modifies your Hero Power, which is usually an inefficient use of your Mana to begin with - although, in fairness, mage is a class that uses Hero Power a lot. 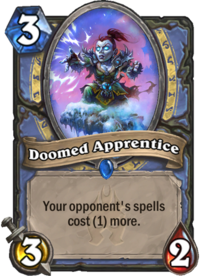 All the same, it costs 4 Mana for a 1/3 minion, 1 damage, and a Frozen enemy. It doesn't even synergise with the death knight mage Hero Power (of which more later). It's really poor value for Mana, which in my opinion makes this a Terrible card. The Doomed Apprentice is the opposite of the Sorcerer's Apprentice. Where the Classic set minion is a 3/2 body for 2 Mana that discounts your spells, Doomed Apprentice is the same body for 3 Mana that increases your opponent's spells cost. I'm not a fan of the body for the Mana cost, but I completely understand why it is so fragile. The effect isn't overpowering, but it can throw off your opponent's game plan. For instance, late in the game, you might want to Flamestrike the board and then play a Secret, or Arcane Intellect - and now all you can do is Flamestrike and Hero Power. This card can slow down your opponent's spell plays just enough if played at key times. It can also act as a "soft Taunt", compelling an opponent to trade into it, which might be all the stall you need to clear or secure the board, or make a slow play. It's not the most amazing card, but it definitely deserves a Fair rating. 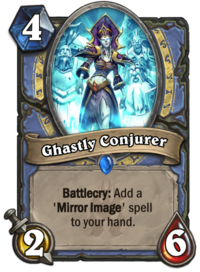 Ghastly Conjurer has a slightly underwhelming body for its Mana cost (Water Elemental, by way of comparison, is 3/6 for 4 Mana). Its Battlecry, giving you a Mirror Image spell, is nothing to write home about, but it does have some obvious synergies: stalling out enemies, especially if you can force warriors, paladins, and hunters to spend weapon charges clearing the Mirror Images, protecting key minions if you think your opponent has run out of board clears, drawing cards with Gadgetzan Auctioneer or creating Fireballs with Antonidas, and, of course, it's a generated spell that works with the mage Quest card. As a 2/6 body, this minion can be played on curve and trade with most minions played earlier, and it can survive board clears such as Volcanic Potion. I think it's safe to call this another Fair card. 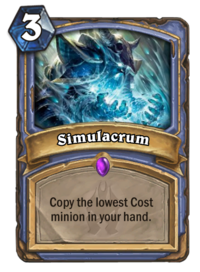 Simulacrum is, I think, a very interesting card. It's not a card for every mage deck, but it works well when you have late game minions in hand (let's say you only have Medivh, the Guardian and Alexstrasza in hand), or when you have steeply discounted Arcane Giants, or when you really just need an extra Flamewaker (in Wild format, of course). It merits a Fair rating. 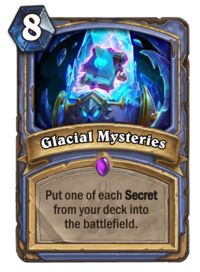 Glacial Mysteries, at first glance, looks like a really powerful card. Unfortunately, it's not. Mage Secrets are expensive, and powerful (they have to be, for 3 Mana). But where paladin could play Mysterious Challenger, thin out their deck, and then often draw into big threats like Dr Boom and Tirion Fordring that they could play almost immediately after, at 8 Mana this card is just super slow. It could have a really powerful effect in a Secret deck, provided your opponent lacks the means to efficiently clear your Secrets, but is unsuitable for any other mage deck. It also works at cross-purposes with Arcanologist, as that card pulls Secrets into your hand (where you do not want them when running Glacial Mysteries). In Wild, a card like Mad Scientist reduces its effectiveness considerably. In all fairness, a Secret deck could use this, and might even find it's very powerful, although it would be contingent on what Secrets you have left in the deck to pull. The potential niche role ensures this card at least gets a Poor rating. 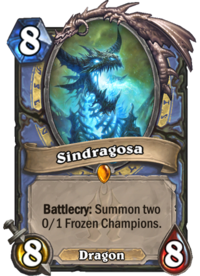 Speaking of slow cards, there's the mage legendary minion, Sindragosa, which at 8 Mana is obviously a slow card. While it has a big body, it's a "plain" body for its Mana cost (an 8/8 for 8 Mana). So, like a lot of other cards, its value comes from its Battlecry. The two Frozen Champions it generates could end up being amazing. Or they could be Lorewalker Cho, or, you know, Millhouse Manastorm. 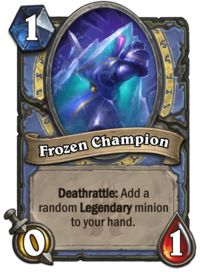 The Frozen Champions have Deathrattle, meaning they synergise with N'Zoth... but I'm not sure you really want N'Zoth bringing back 0-Mana minions unless you're really keen at getting random legendary minions. There is an upside when using Sindragosa with the new mage death knight, which I will touch on shortly (especially given Sindragosa's Mana cost), but overall, if you have room for only one giant dragon card in your deck, it's probably going to be Alexstrazsa over Sindragosa, who I am assigning a Poor rating. Here's Jaina's new Hero card, introducing her death knight version, Frost Lich Jaina, along with her replacement Hero Power. She could be the villain in a C.S. Lewis novel. Only cooler (har!). Like a lot of the heftier death knights, this card is very slow at 9 Mana. A Water Elemental is 4 Mana, so you're spending 5 extra Mana for the altered Hero Power, 5 Armor, and bestowing Lifesteal on all your Elementals for the rest of the game. And, with a little diligence, you can start generating Elementals with Lifesteal that Freeze enemies. 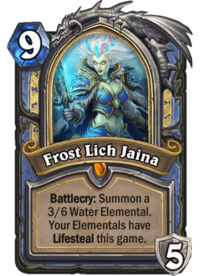 Frost Lich Jaina is most at home in a deck that runs various Elementals, but I think she fits in any mage deck that isn't a fast-paced tempo deck. The reason for this is that her Hero Power is a straight-up upgrade over the basic mage Hero Power. It does the exact same thing the old Hero Power did, but now you can get a 3/6 Lifesteal Freezing minion out of the deal. Thanks to the flexibility of the mage Hero Power, you can use 2 Mana to get an ostensibly 4-Mana minion (with Lifesteal as a bonus) off of anyone on the board, including your own minions. Got a badly-damaged minion? Hit face with it, then ping it to replace it with a 3/6 Lifesteal Freezing minion! You can follow this up on turn 9 with a turn 10 Sindragosa, pinging one of the Frozen Champions yourself to get an 8/8 Dragon, a 3/6 Lifesteal Freezing Elemental, a 0/1 Frozen Champion, and a random legendary minion in your hand, all for 10 Mana, which is actually pretty good value. In Wild, there are further possibilities. Ping a Boom Bot that your own Dr Boom generated. Ping Sylvanas Windrunner. This was a lighter post, cards-wise. Now that I've got through about half the set, I hope I can keep at this lighter pace until the expansion is finally released.